As Rwanda National Police (RNP) marks 18 years, it has dedicated the first week of the anniversary activities to raising awareness against narcotic drugs. Police Week activities across the country commenced on Tuesday with the construction of Village offices, at least one crime free per district, and other community development activities. Other activities include distribution and installation of solar energy to the disadvantaged families, planting trees in an effort to conserve the environment and distribution of television sets to each constructed crime free village office. At least 30 villages-one in each of the 30 districts-will get offices while over 3000 households will be lit with solar energy. According to Assistant Commissioner of Police (ACP) Damas Gatare, the Commissioner for Community Policing in RNP, the first week will also focus on mass sensitization campaign against narcotic drugs. “Narcotic drugs like cannabis, kanyanga and other banned gin, and locally made illicit brew with different brands are one of the major impact crimes in the country; they affect youth and family development; wreck families and affects security, education and health sectors among others; this is why fighting trafficking, making, selling and use of these psychotropic substances has been one of the priorities of RNP over the years,” ACP Datare said. The campaign and fight against drugs is also in line with the implemention of the national directive as adopted during the recently concluded National Dialogue. In the last five years, Police recorded 18,383 cases related to narcotic drugs. Last year alone, Police recorded about 4470 cases constituting 18 per cent of all crimes registered during the year. More than 4100 drug dealers, 3600 of them males, were also arrested last year with those aged between 18 and 35 years accounting for 71%. At least 48 drug dealers arrested last year were aged below 18 years, according to the Police. “In this week, together with partners in public and private institutions, and the media, we are reaching out to different groups including students and other youth groups, and communities to the grassroots level as part of the effort to prevent the local market but also strengthen partnership with the general public to identify and break the supply chains,” he explained. This year’s Police Week is held under the theme: “18 years of Partnership in Policing: Towards a Crime-Free Village” and is intended to cement the concept of community policing and to strive for crime-free villages. “Preventing the local market also involves rehabilitating the addicted ones and making sure that there are no new users. It’s a possible aspect when every person understands and owns it,” ACP Gatare said. Since 2012, about 12,228 addicted youth aged between 18 and 35, have been rehabilitated and equipped with vocational skills, with about 90 per cent of them now completely healed and engaged in income-generating activities. In December last year, RNP alongside the ministries of Health, Local Government, and Youth, Private Sector, Faith Based and Civil Society organizations, launched a countrywide campaign against narcotic drugs, a move that also aimed at both breaking the supply chains of supply and to destroy the local market. 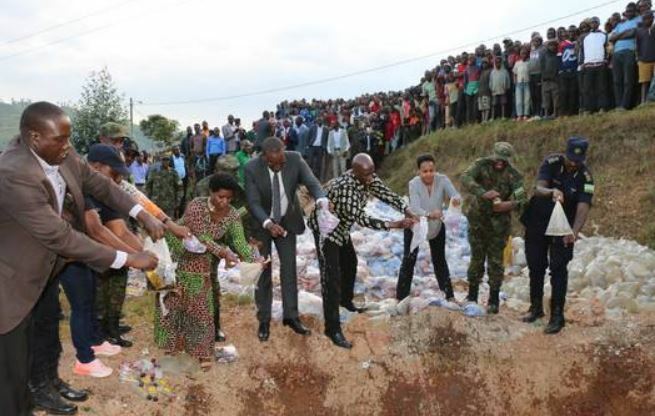 As a result, narcotic drugs valued at over Rwf400 million were seized and destroyed between November last year and January this year in Burera, Gicumbi, Kirehe and Rubavu, the districts mapped as one of the major transit routes. In last December, about 160 drug dealers were arrested in Burera alone. RNP also boosts of other community policing groups that have been instrumental in raising awareness against crime and drugs in particular. They include over 260000 membvers of Youth Volunteers in Community Policing (YVCP), Police Anti-crime Ambassadors, 150,000 Community Policing Committees (CPCs), close to 2000 Anti-Crime and Drug clubs in schools, transport associations, media fraternity, artists, and faith based organizations.